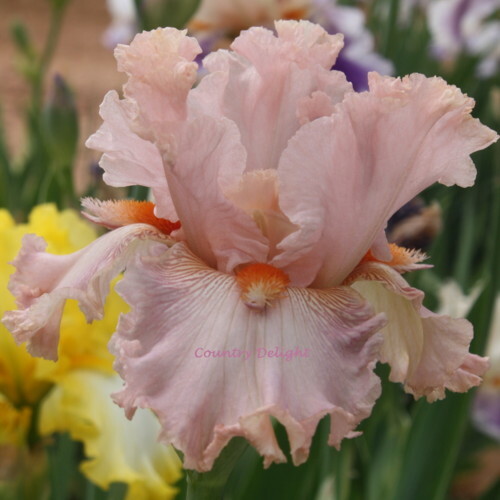 From Blue J Iris online catalog, 2017: VENUS IN PINK - Leonard & Kathryn Jedlicka, 2008, TB, 35”, M. Bushy tangerine beards and very consistent ½” light lavender horns highlight this SA. Standards and falls are medium pink and very ruffled, with serrated edges. The falls are enhanced by a faint purple wash and vein lines on the hafts. Styles are light pink. Stalks have good branching with 7 buds. (Formerly seedling Jeda 4-39M48) Jeda 2-2A7 [Coral Point x Meininger sdlg “White Extra”] X Coral Pincushion. jpg VenusInPink1.jpg manage 50 K 10 Sep 2018 - 19:55 Main.TLaurin Photo by South Jersey Iris.